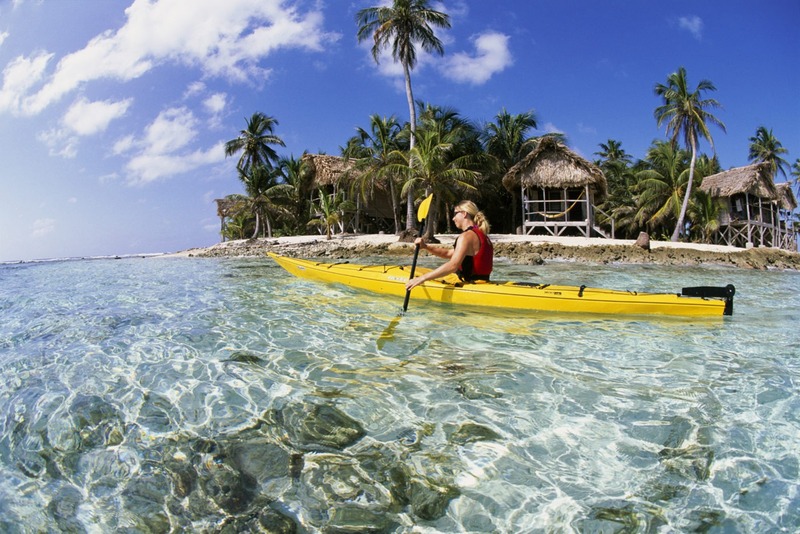 EXPLORE BELIZE BY PADDLE, SAIL, SURFBOARD, AND MORE! Belize Adventure Week — our ever-popular, action-packed Belize adventure tour — explores this fascinating country using a multi-sport format. 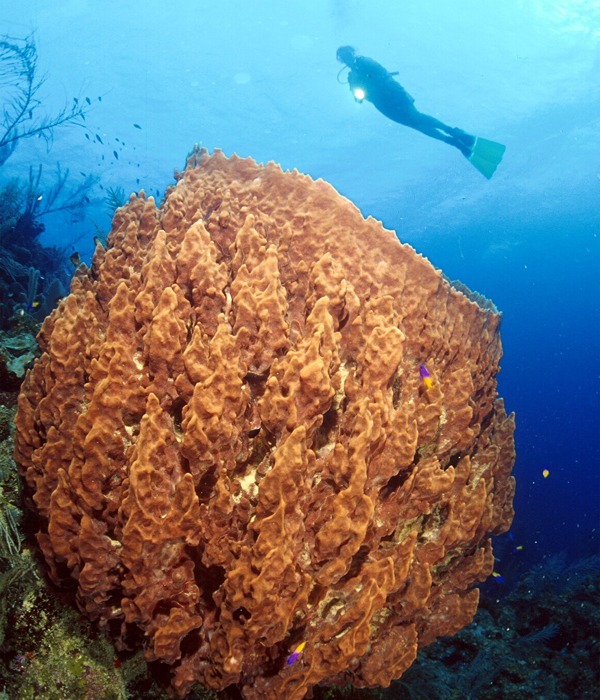 This active vacation is the culmination of 33 years of our Belize discovery. We start at a beach lodge in a coastal village, transferring to the jungle early the next morning for waterfall rappelling and ziplining on the longest zipline in Central America. 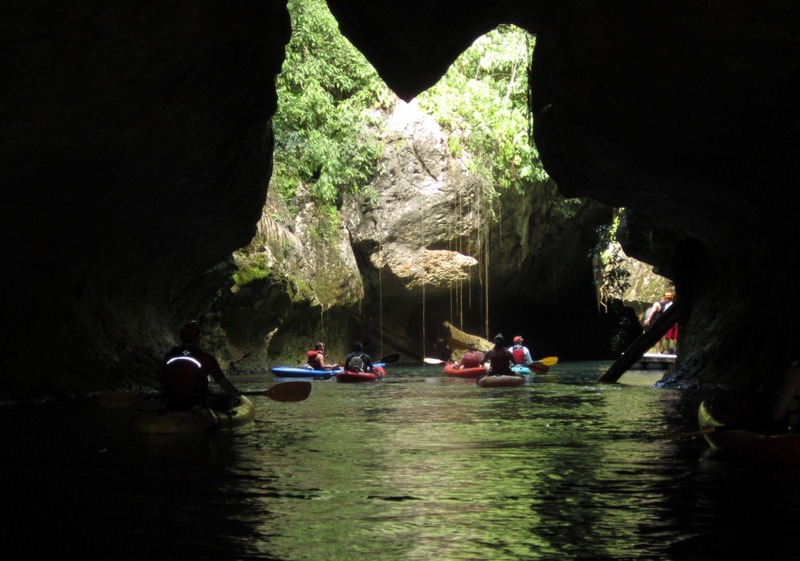 From there we transfer to western Belize to spend two days learning to kayak on the Mopan River, exploring the Mayan Ruins of Xunantunich, and cave kayaking in Belize before finishing up in Belize City. If you only have 4 days in Belize you can join us for the first few days of this adventure as a stand-alone package. Mid-week we travel far out to sea to Slickrock’s exclusive Long Caye Resort Belize at Glover’s Reef, a National Marine Reserve. 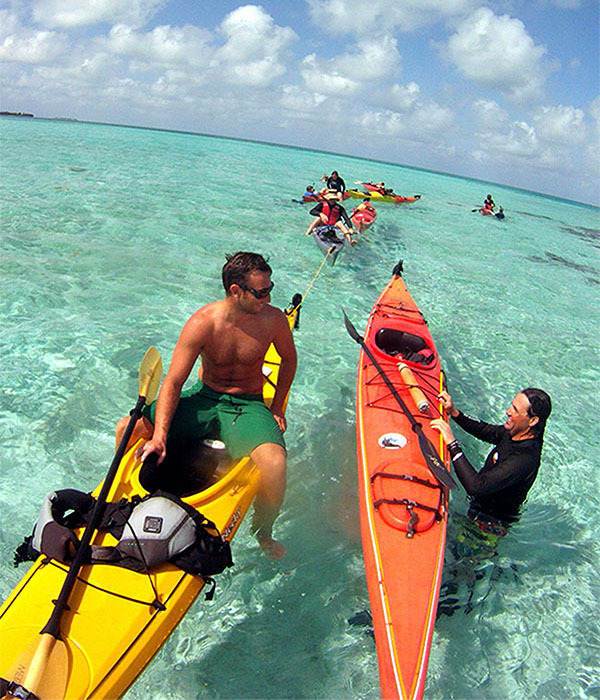 Here we use sea kayaks to access snorkeling sites and other islands in the atoll. We have top-notch surf kayaks, surf boards, and paddleboards to take advantage of our private wave. Fully-outfitted fishing kayaks and windsurfing rigs for all levels complete our amazing fleet of sport gear. 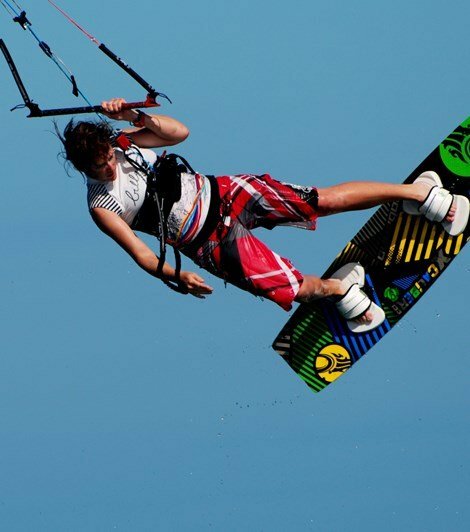 World-class kitesurfing and scuba diving are also available for an extra fee. We spend 3 nights on the island, with guided sport activity and instruction sessions offered from early morning until late at night. The island portion of the package is also available as a stand alone, 5-night adventure tour. We have the best set of sports gear in Belize! 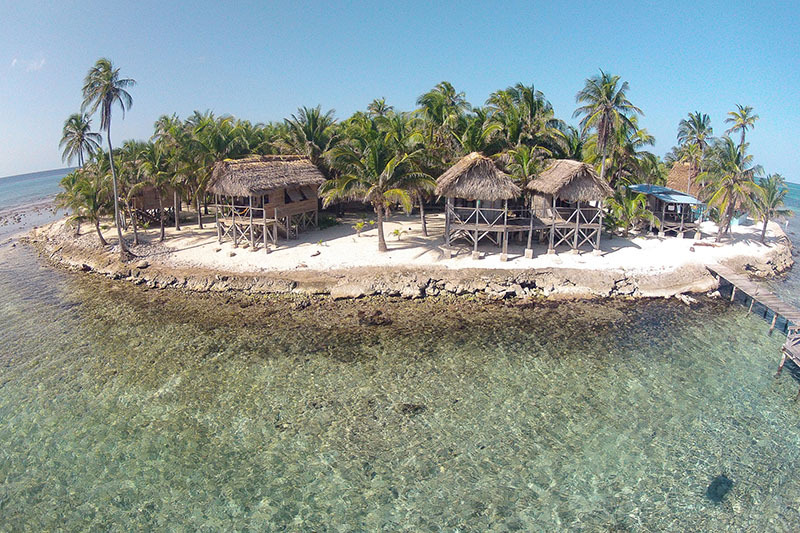 Our Belize eco-resort is powered by the sun and wind, and our Belize beach bungalows are perched right on the shore. 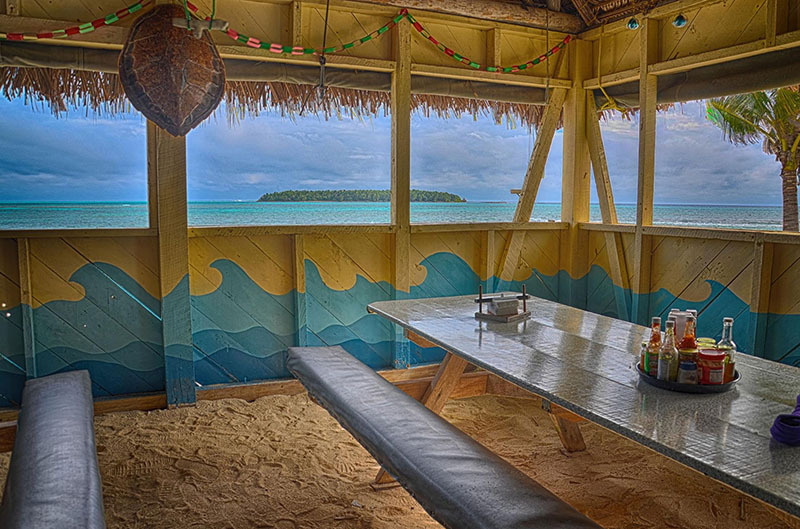 Our huge open-air dining hall is the center of island life, where you enjoy cold drinks and home-cooked meals. Our composting toilets and showers pumped by the sun complete our eco-friendly set-up. Long Caye offers a backdrop few locations can match. 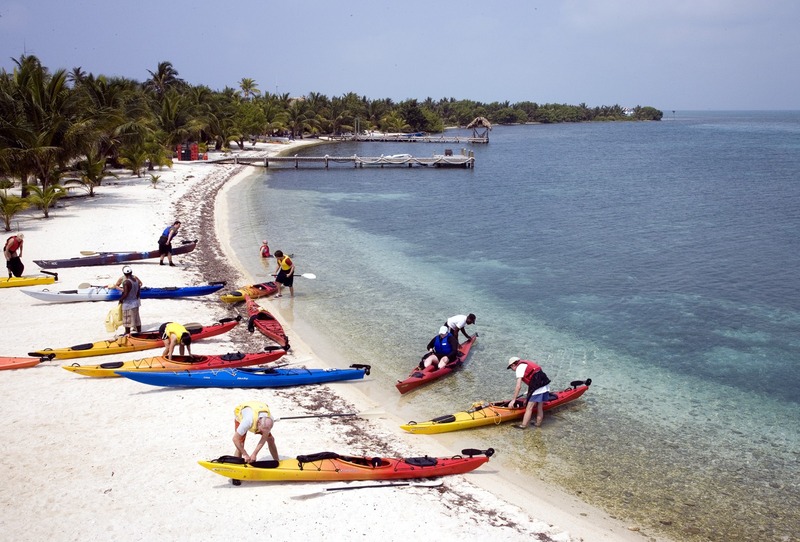 We are the only adventure tour operator in Belize with a private island! 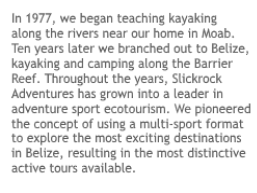 This kayaking trip is designed for those looking for active vacations, and although no experience is required, some guests may find the activities strenuous (particularly the hike to the rappel and the portages on the Caves Branch River). Each sport is introduced, taught, and guided by expert guides, and each sport is suitable for a complete beginner in good shape. People who are in good physical shape and have a good attitude will do fine. Hundreds of our guests have commented that this Belize adventure vacation was the best of their lives. Come see for yourself why our guests return year after year! 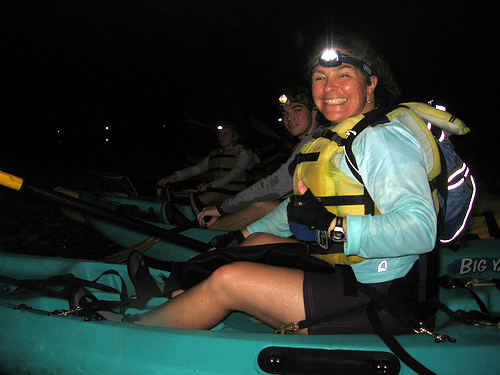 Descend an underground river by kayak, finding our way with headlamps. 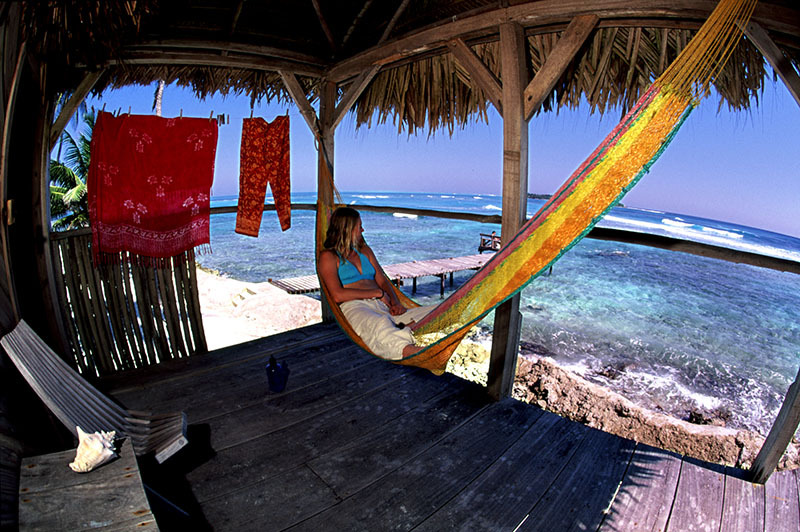 Kitesurfing lessons and Belize dive packages are at an additional cost. 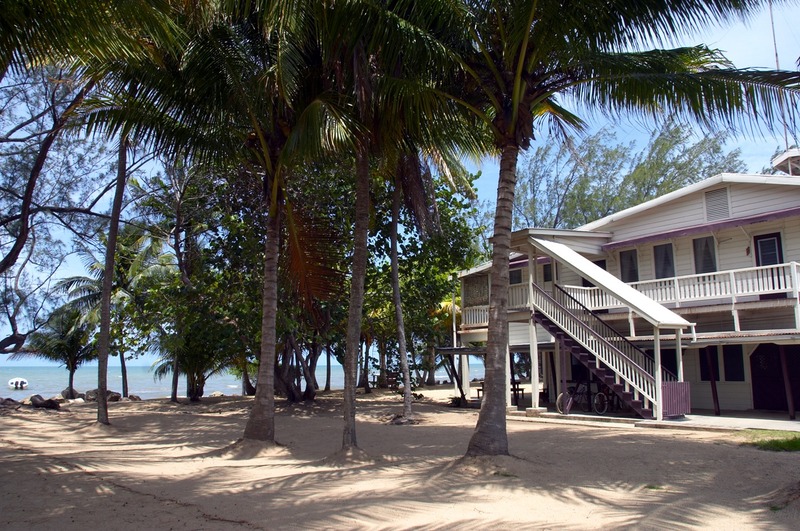 The perfect place to start your trip, Pelican Beach is located on the Belize coast in Dangriga. This charming lodge will remind you of the Florida Keys in the 1950s. Located only steps from the airstrip, you’ll be enjoying a cool drink on the edge of the Caribbean in just over one hour from landing in Belize. 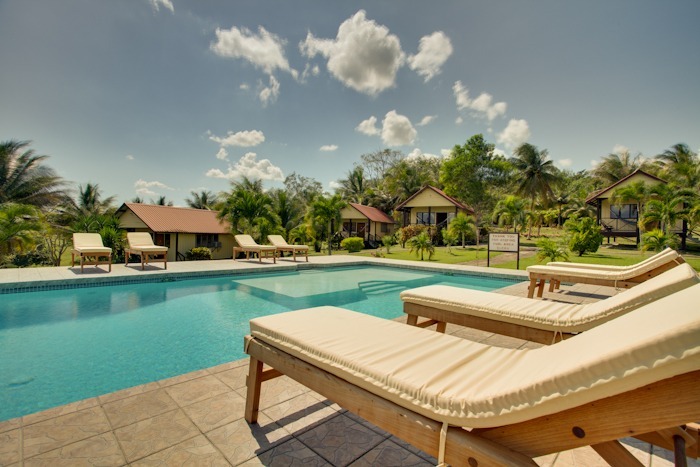 Cassia Hill Resort is located in the Cayo District, the most popular inland destination in Belize. It’s the perfect location for our tours because it is accessible, and yet feels quite remote. They are located near several of Belize’s greatest natural attractions including well-known Maya Temples, caves, rainforests, and jungle rivers. Cassia Hill Resort’s accommodations have all of the modern conveniences in a lush tropical setting. The resort property also features cable television, a restaurant with a bar and lounge, a recreation area and fitness center, a swimming pool, and an equestrian center. There’s also a gift shop and phone and internet are available. 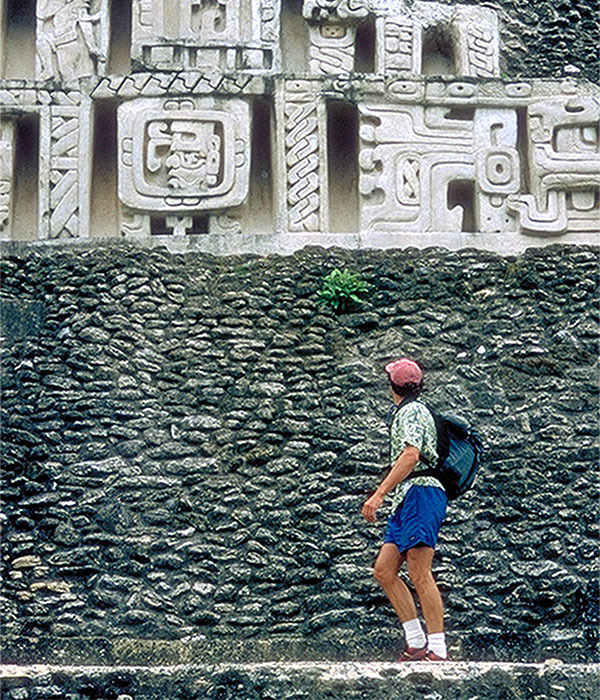 Related Blog Post: Planning to travel alone to Belize? On Long Caye, development means sixteen cabanas, a well-stocked kitchen, solar-powered water pumps, a composting toilet, a hammock palapa, a dock just for watching the surfers from, three dozen sea kayaks, a bunch of sailboards, surf boards, and surf kayaks, a kitesurf center, and a dive shop (the only thing not owned by Slickrock). There is no air conditioning, maid service, email, and no flush toilets (since we are an eco-resort, we flush nothing into the sea.) But there is a fridge permanently loaded with Fantas and Belikin beer, and we are so lucky to have one of the best Belize beaches. It’s the best in adventure travel — right down to the Belizean guides who guide you to new snorkel spots all day and then join you for dinner. Depending on your experience, our Water Sports Center is either the cushiest camp or the most rustic resort you have seen. We keep the island in as natural a state as possible, and there is no standard electricity or plumbing. Cabanas are perched above the surf, and the ever-present breeze keeps the temperatures well below what they are on the mainland. Each cabana has single or double beds, a solar-powered light, and a porch with hammocks and lounge chairs. 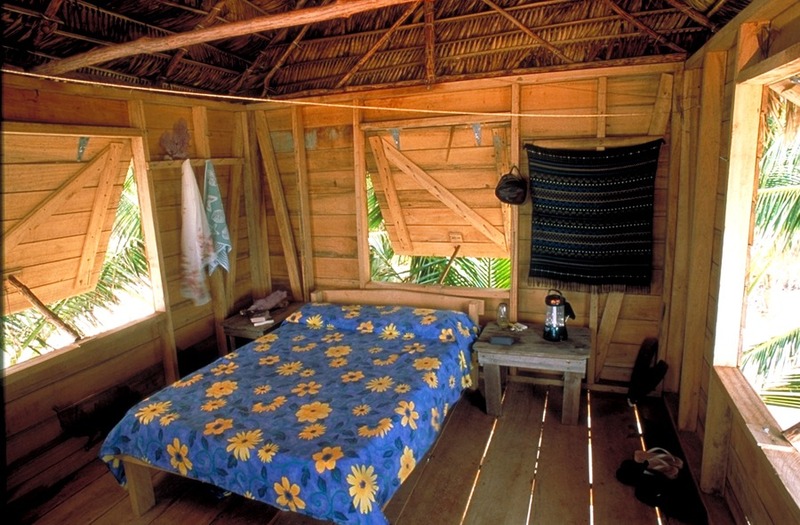 To learn more about our Belize beach huts, visit this page on our site. Our dining hall features solar and wind-powered lights and music, propane stoves and solar refrigerators (for cold beer and soda! ), and our extensive library. We drink collected rainwater, and we bathe with well water pumped by the sun (not heated, the showers are about 75 degrees). Composting toilets complete this ecologically friendly set-up. Our spacious island (13.5 acres) and rustic facilities ensure your comfort without compromising the adventure of living on an undeveloped and uncrowded island. Best of all, a hammock with your name on it is waiting under the palms. 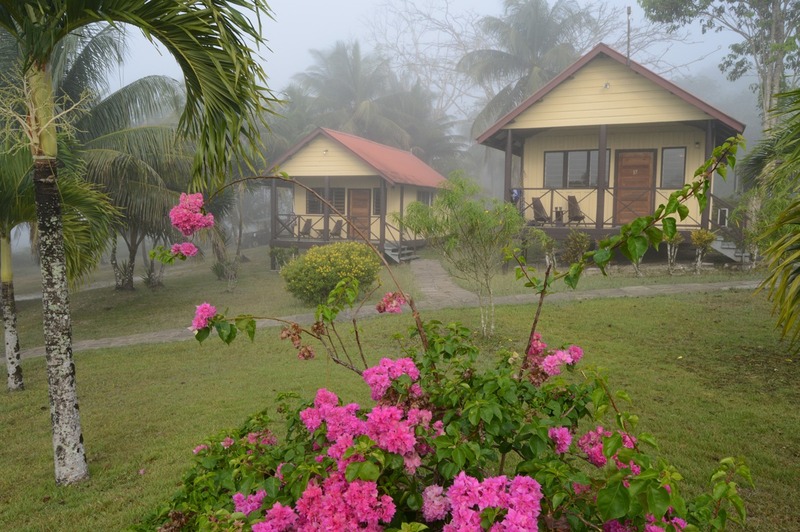 For more details on the sustainable facilities at our Belize eco resort, visit this page. Every Adventure Island experience includes a Digital Detox. No cell phones or email! Wake to the sounds of nature; no alarm clocks either. You will experience a wonderful thing: Island Time. Please visit our Long Caye page to view more photos of the island. 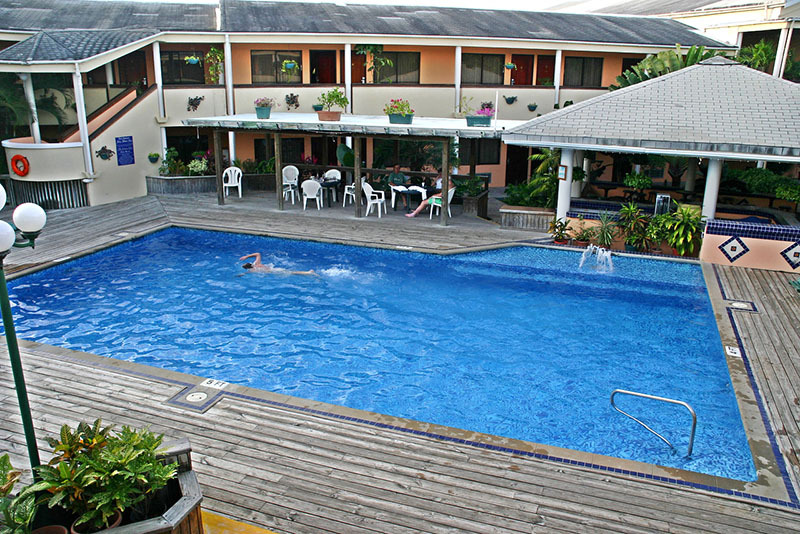 The Belize Biltmore Plaza Hotel is a full-service hotel located on the outskirts of Belize City, three miles from downtown near the airport. The Biltmore has a business center, beautifully landscaped courtyard, swimming pool, great restaurant, bar, gym, gift shop, tour desk, and internet cafe. It’s perfect for guests who arrive early, stay late, or who have just a few extra hours in the city.